Brazil´s domestic political situation remains very uncertain due to the massive corruption scandal around the state oil company Petrobras (state prosecutors alleged that leading construction companies and other businesses paid huge bribes to high-ranking officials of Petrobras and to politicians in return for contracts). More than half of Congress members and even President Michel Temer have been implicated. Congress has twice rejected corruption charges against Temer for allegedly taking bribes, saving him from facing a possible Supreme Court trial. Although politically weakened, this rejection has raised the chances that Temer will stay in office until his term ends in January 1st, 2019. However the corruption scandal and the alleged involvement of so many high ranking politicians casts its shadow over the upcoming October 2018 presidential and mid-term parliamentary elections. 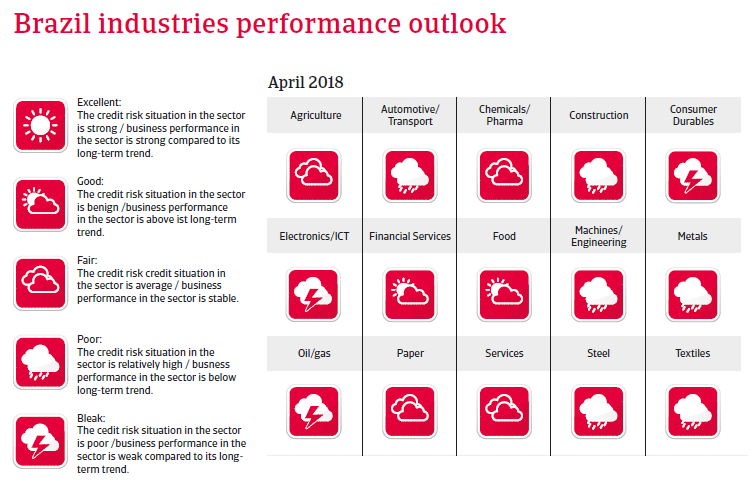 Ongoing political uncertainty ahead and after the elections could have a negative effect on the sentiment of businesses, consumers and investors, negatively affecting the current economic rebound. 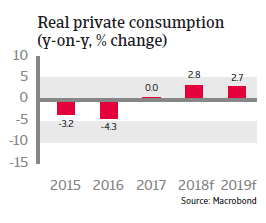 In 2017 Brazil´s economy emerged from a steep recession, mainly helped by rising exports and a rebound in private consumption. 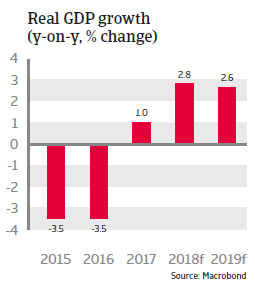 GDP expansion is expected to accelerate to more than 2.5% p.a. 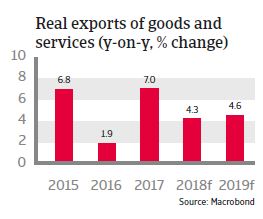 in 2018 and 2019, supported by further increasing exports and private consumption as well as investment growth. 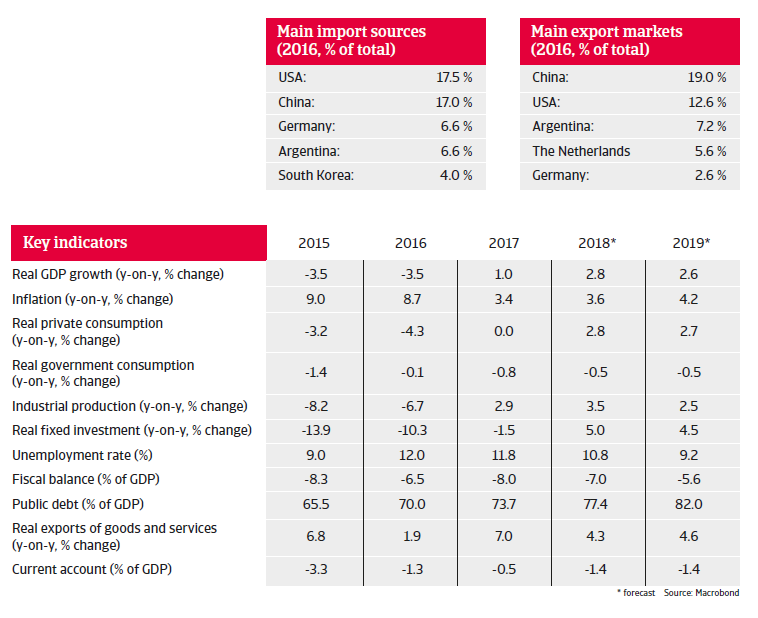 However, export growth could be impacted by US import tariffs and disruptions in global trade flows. 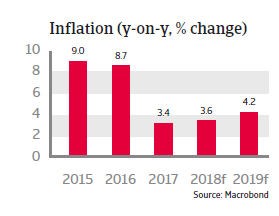 Both investment and lending are helped by monetary policy easing, as a sharp decrease in inflation enabled the Central Bank to gradually lower the benchmark interest rate from 14.25% in October 2016 to 6.50% in March 2018.
Business insolvencies have increased significantly in 2015 and 2016 (in particular judicial recovery cases rose about 45% year-on-year in 2016). In 2017 judicial recovery required cases decreased 24%, while bankruptcies requested declined 8%. Due to the economic rebound business insolvencies are expected to decrease further in 2018, but to remain on elevated levels. The rebound has been strongly supported by more orthodox economic policies of the Temer administration in order to improve government finances, increase investor sentiment and enhance productivity. This includes constitutional amendments to curb public spending growth, ease regulatory burden, modernise labour relations and tax reforms. However, the economic environment will remain challenging, given the fragile political environment, high unemployment, and a much needed fiscal policy adjustment. 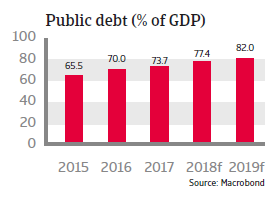 The sizeable fiscal deficit remains Brazil´s major economic weakness, with government debt expected to increase from 56% of GDP in 2014 to more than 80% of GDP in 2019. For the time being, the fact that the major share of public debt is financed domestically (85%) and in local currency (95%) at an average maturity of almost seven years mitigates currency, refinancing and sovereign default risk. While the adoption of a constitutional amendment to eliminate automatic budget spending growth in line with inflation increases is a crucial step to curb spending, the real issue is pensions, as expenses for pensioners currently amount to one third of the federal budget before interest payments, or 9% of GDP. Any pension reform requires a constitutional amendment (which must be passed by a three-fifths majority in both houses of Congress), and the government has withdrawn a (diluted) pension reform proposal in February 2018 due to a lack of parliamentary support, meaning that no corresponding law will be passed before the presidential and mid-tem parliamentary elections in October 2018. Due to a relatively high stock of portfolio investment inflows (more than 140% of international reserves) Brazil remains vulnerable to changing investor sentiment. The ongoing political uncertainty will keep the currency vulnerable to shifts in market sentiment, and the real is expected to depreciate further in 2018 against the USD, albeit modestly (by about 2.5% on average). However, a strong financial sector and relatively low external refinancing needs enable the flexible exchange rate to act as a shock absorber, while investors do not appear to be overly concerned about the unlikelihood of a comprehensive pension reform in the short-term, reducing the risk of a sudden souring of sentiment. Brazil´s external financial situation is expected to remain robust. External debt is still quite low and liquidity is more than sufficient to cover imports (more than 20 months in 2017) and external refinancing needs. The current account deficit is expected to increase in 2018 on the back of increasing imports, but is fully covered by foreign direct investment. Foreign currency debt has risen in recent years on the back of sharply rising corporate debt (up to about 60% of total foreign currency debt). However, this debt level has stabilised in 2016, and two thirds of foreign currency corporate debt is intercompany debt, which is less exposed to refinancing risk. Most externally indebted businesses have either hedged their currency risk or have access to large foreign currency reserves. Additionally declining interest rates on domestic debt mitigate the impact of the expected monetary tightening in the US on debt service. Brazil´s banking sector is well regulated and sufficiently capitalised. The system is not dollarized and the dependency on external wholesale financing is low, shielding the banking system from adverse shocks. The share of non-performing loans has decreased in 2017 compared to 2016 (to 3.6% end of 2017).